Showing The Ground Feeders Some Love (354/365) – Annoyingly Boring? 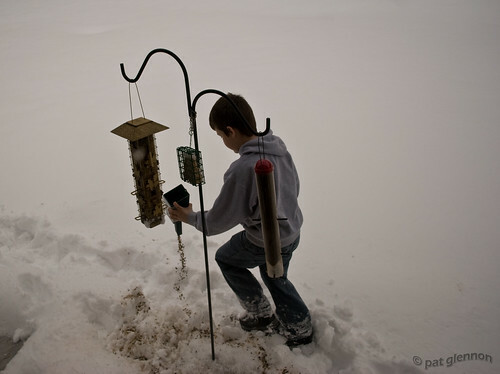 My oldest was out filling the feeders today and after the mixed seed feeder was full he dumped the rest on the ground for the doves and juncos. What a guy. Supposedly, I’ve got the juncos, too. I’ve yet to definitively identify them. and Dan, we have no rats! What kind of place do you think I’m running here? Rupe didn’t know rats dug snow. *hmph* You learn sumpin’ new everyday …..
What are all these cheesy ads cluttering up your website – have I been missing them up until now or are they new? hey, i got a 600 dollar camera i gotta pay for somehow. I have earned .39 cents in the last two days – so back off! You sent your kid out without a jacket? No wonder half your kids are turning out to be dirty hippies. Poor parenting! Love the photo Pat – my bird feeder is one of my favorite place to take photos – but you probably knew that!